Let’s start with a question: what is REALLY the best vape tank? The answer is very simple – it’s any tank which makes you a happy vaper and keeps you off the traditional cigarettes. My point is, it makes no sense to go for a trendy tank subohm or not, only to find out that it leaks on you because the setup is too complex for you. In addition, if your vape buddies chuck huge clouds and you get to cough at too warm vapor, why forcing it? If DL style of vaping doesn't suit you, simply go for a solid MTL (mouth to lung) tank with satisfying vapor production and a great flavor. For some vapers, 100W mod which powers the latest generation of DL (direct lung) tanks is NOT enough: they need 150-200W. Others are happy with a tank that needs a modest power of 20W. So, choosing the tanks based on how trendy they are is not the way to go if the tank doesn’t meet your needs. Going for the cheapest tanks out there is also a poor choice – you will end up with poor quality product and a headache. My advice is to go for well-established brands. They guarantee great design, good quality materials and superb performance. Clamp deck for super easy coil building! Chamber lock system secures the juice port ring and chamber! Domical chamber for better flavor! Direct lung or mouth to lung style - How to make the right choice? 0.1 Direct lung or mouth to lung style - How to make the right choice? 0.3 What does a vape tank consist of? 0.4 Should you buy a rebuildable tank atomizer or use stock coil heads? First of all, you should buy a tank which suits your style of vaping. Are you vaping Direct Lung style (DL) or Mouth To Lung (MTL)?The right choice would be to try a tank and find a few models which have the best value for money but also the best ratio of user-friendliness and performance for your style of vaping. Vaping enthusiasts will get almost each new tank just to tackle it, try new builds or simply out of sheer love for vaping gear. This is great, too. It prevents boredom and enriches their lives while keeping them off the stinkies. Having said that, there are hundreds of tanks to choose from which can certainly be overwhelming. Start with reading the reviews or watching your favorite vape YT channel, maybe go to a vape meet and try out the new DL or MTL tank a friend has already bought. You will have a different feel for the atomizer once you have it on your mod and in your hand, that’s for sure. Your tank also has to fit your vape mod in terms of power as well as the ergonomics and design. Who is this article for and why? Let’s make it clear: after almost 4 years, I consider myself an advanced vaper. I’ve tried hundreds of mods and tanks. This article is NOT directly targeting advanced vapers – we already know a lot about vape gear and can deal with all the little as well as not so little bugs new atomizers may come with. This article is for novice vapers and vapers who are planning to upgrade to best box mods, RDAs and subohm ﻿RTAs and RDTAs, especially rebuildables. If you are an advanced vaper, how will you benefit and what can you do? Pass on the knowledge, my fellow vapers! Even if you are an advance vaper and probably know everything I have to say on this matter, you will still benefit from having all the basic info here and use it to help less experienced vapers. Advanced vapers should help others with advice and tutorials and hands on practice. We should all do as much as we can to help novice vapers go through the transition from cigarettes, cigars and tobacco to vaping as quickly and effortlessly as possible. Vaping community is strong today and we need to strive to make it even stronger, more educated and more generous when it comes to helping others. What does a vape tank consist of? What you need to do regularly is check that all the parts are intact and that there are no damages to o-rings in order to prevent leaks. Also bear in mind that glass, PU or PC can and will crack when in prolonged contact with tank cracking juices such as cinnamon. Tanks also crack when you over-tighten the atomizer. Do it firmly but gently. The threading on the 510 connection, the atomizer base and the top tank should also be treated with care. Make sure not to miss the first thread when screwing the atomizer to your mod or when you are screwing the tank pieces together. Look for wide slots if you prefer DL style. Also look for convenient top fill design, if possible, for all vape tanks you are considering as an option. 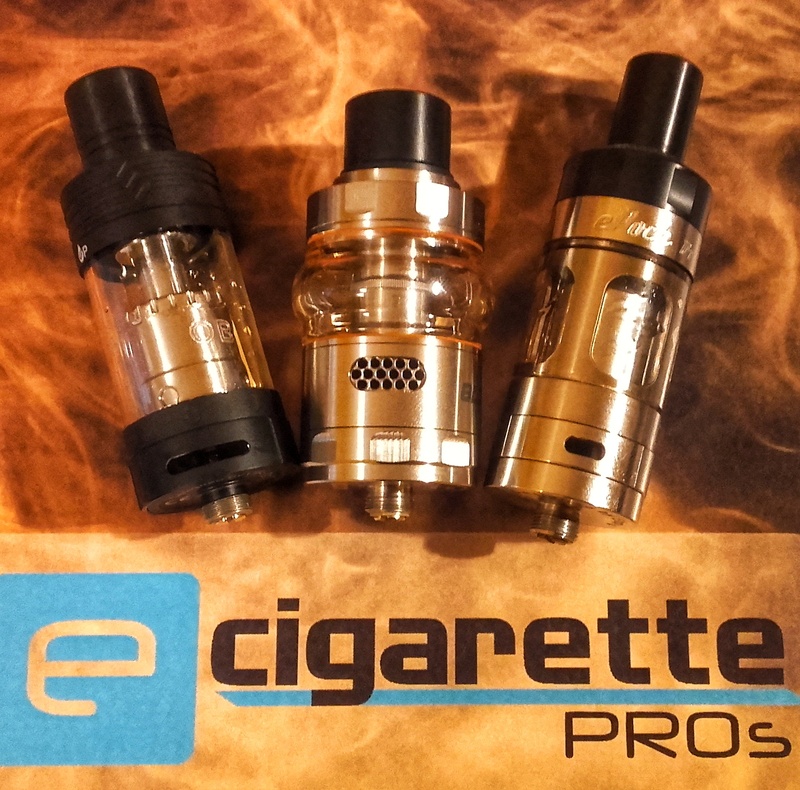 Should you buy a rebuildable tank atomizer or use stock coil heads? This is a matter of personal preferences and interest. RTAs (rebuildable tank atomizers) have a deck which you can use to build all the different coils you like in order to boost the flavor, the vapor production or both. The coil building wires of all sorts are cheap and so is good quality cotton. Only few tools are needed and some patience! If you are not into coil building or if you have just started vaping, you can choose a convenient option of a tank which uses a prebuilt coil heads. In that case, make sure to buy a tank which uses inexpensive and widely available stock coil heads. To sum up, you will need a few tanks so that you can vape different juices without the need for washing the tank. There are hundreds of tanks out there, so take your time and do follow our blog and read our reviews because we will review all the latest and best vape tanks for you! This is a direct lung, single coil, bottom airflow, top filling tank with the build deck covered by a chimney which leads up to the top cap. Pharaoh Mini RTA is a single coil atomizer 24mm wide and just over 55mm in height if you use the Rip Trippers wide bore drip tip. You get a bunch of accessories including a 2 and 5ml tank. Digiflavor Pharaoh Mini is the result of the collaboration between Digiflavor and Rip Trippers. It is simple enough to build on, and resembles a cross between the Ammit 25 RTA and the Govad RTA. The build deck is just like the regular size Pharaoh. It has two clamps which rise up thanks to the built in springs as you unscrew them. The airflow enters directly underneath the coil. The springs and the clamps work really well and they make screwing and unscrewing while building super easy and hassle free – the springs make the clamps rise as you unscrew them. The tank is quite forgiving about the amount of wick you use so expect no problems there. In general, this tank has had mixed reviews from my fellow vapers. Most agree that it’s a solid tank with a few quirks once you get to know it. Others simply don’t like it that much, probably because it’s not as revolutionary as Rip Trippers shouts it to be. The overall build quality is as expected from Digiflavor. Does Pharaoh Mini rebuildable tank atomizer stand up to the hype? You decide! Berserker Mini mouth to lung tank is a smaller version of Vandy Vape Berserker featuring the same bullet shape, tight draw and excellent flavor. Once you switch to the Ultem tube, you will be able to see your juice level clearly. The base section features the airflow control ring with machined out teardrops all the way around. One of the teardrops is cut out for airflow adjustments of 0.8mm, 1.0mm, 1.2mm, 1.4mm, and 1.6mm. The Berserker Mini's build quality is of the highest standard. This tank looks good on every mod with all metal, Ultem or clear glass tank look. Plenty of spares included for your peace of mind. The build deck is 6.5mm wide. It accommodates small builds which are typically used for mouth-to-lung. There are four hooks available for you to wrap the coil around them easily and prevent the coil from shorting. On the building deck, there are two 2mm wicking ports for optimal wicking. Your favorite juice will wick the cotton through two 8.5mm by 4mm juice slots located on the top. The Berserker Mini MTL RTA by Vandy Vape offers optimal flavor production for mouth to lung style combined with great building functionality and a convenient top-fill system. This certainly makes this handsome little fella one of the most versatile mouth to lung rebuildable tank newcomers. Zenith MTL tank is the latest MTL flagship tank from Innokin. YT reviewers Phil Busardo and Vaping Greek really put a lot of thought into designing a trouble-free tank for the ex smokers. The convenient top fill design where you simultaneously close the liquid while opening the top fill port may not be new in the market but it’s still a great feature for the novice vapers. Another convenient option is using the stock single vertical kanthal coils of 1.6 ohms for MTL rated for 10 to 14W and a 0.8 ohm restrictive DL or MTL coil, rated for 15 to 18W. The 1.6 ohm coil has zero break in time and gives a decent throat hit with full flavor while the 0.8 ohm coil gives a more airy vape and may take a while to break in. Both coils from Innokin are simply inserted into the tank using the aligned grooves. This plug and vape feature is also hassle free and aimed at novice vapers. The airflow offers 5 levels of adjustments as you open/close the AF ring over 5 tiny holes. It’s not as tight as the old-school MTL tanks but it will successfully mimic the experience of smoking which will help the novice vapers with easy transition to vaping as a much less harmful alternative to tobacco. The Innokin Zenith MTL atomizer comes with two 510 drip tips and with 2ml as well as 4ml juice capacity tank. Nothing much new with this tank but no major cons either. The new vapers will probably like using the readily available pre-made coils in a tank which is hassle-free and comes at an affordable price. TFV12 Prince Tank from SMOK comes with the impressive amount of eliquid capacity – 8ml! The tank also features a great machining and a stylish design. It comes with three monster coils for all the power addicts who are chasing those huge clouds but also like a mouthful of flavor. The TFV12 Prince Tank features a wide cylinder shape piece of glass which enables 8ml capacity in addition to the regular 5ml tank. The Prince Tank comes with even more massive airflow. The drip trip has also been upgraded to a Cobra Drip Tip to handle that gust of vapor. It comes with a great looking design to it. Another new feature of the TFV12 Prince Tank is the top fill sliding door. It is now opened using an unlock button. This adds another safety measure to prevent leaking. This new press to open Top Fill System wasn’t featured on the previous SMOK tanks but is now fully implemented into the TFV12 Prince. The single fill port and a maximum tank capacity of 8 milliliters makes the Prince TFV12 tank a true monster tank in terms of capacity and ease of refilling the tank. The standard 25mm base will make the Prince Tank from SMOK look great on high-powered dual and triple 18650 mods. The price point is just right for the quality and the extras you’re getting. Yet another amazing tank from SMOK! Triple 28 RTA from Vandy Vape and YT reviewer VapingwithTwisted420 comes with a postless style deck and 4ml capacity with the diameter of 28mm. The bottom airflow right comes from under the coils and the great quality hex screws allow for an easy build with one lead going in each side. This positions your single or dual coils perfectly. What’s more, triple coils are also possible! ​Having said that, this tank is not the easiest for novice coil builders because you need to pre-cut your wire leads to the optimal length. You need to position your coils as low as possible so that you don’t short out because the coils are touching the top cap. Even though a single coil can also be built, we wouldn’t recommend it because Triple 28 RTA screams for more air and more power. This tank shines with two or three coils! Wicking is also easy and there are no leaks. This is another tank which is quite forgiving as long as you don’t use too much cotton to choke it. Where Triple 28 RTA really shines is building large dual and triple coils. It has massive airflow so you need a lot of watts and big builds. At the minimum of 80 watts, the flavor on this this tank is rich and the vapor production is outstanding. This tank from Vandy Vape has bottom airflow and the smooth AFC ring. The knurling on it makes it easy to adjust the AF when the tank is on a mod. The standard top fill allows you to simply unscrew the top cap and use any of the two large fill holes. The top cap also has knurling which makes it easy to grip and unscrew. Triple 28 RTA comes with two 810 tips (a Delrin and Ultem), and a 510 adapter is included for your favorite 510 tips and lots of cool spares and extras. Do give it a shot! Valyrian tank from Uwell is not the latest tank on the market but it certainly deserves a review. It comes in 5 different finishes, each with two different color drip tips and o-rings, for those of you who are into the matchy-matchy tank design. The filling ports are accessed by pressing the button near the top of the tank. This causes the top cap to unlatch and hinge on the opposite side. You can use the two kidney-shaped top fill holes of generous size to top up your favorite juice. The rubber grommet underneath the drip tip will prevent any leakage. The coils included are both 0.15Ω vertical coils with the rated wattage of 95-120w. The tank section consists of the glass, a chimney and the coil. The glass is a 25mm Pyrex tube for maximum durability. You will also get a spare glass, just in case. This tank features an airflow control ring with a stop, which I really like. It only rotates from fully open to fully closed, not all the way around. There are three large slots in it. The slots are fully adjustable and allow the massive airflow right to the base of the coils. Using the stock coil at 95 watts, you get a flavorsome and pleasantly warm vape with plenty of clouds and no dry hits. At 110 watts, the vape is also full-flavor with chunky clouds coming out. I don’t think higher wattages will bring you the same quality vape without diminishing the flavor and causing a few dry hits, however. With Valyrian tank you will get two different coil airflow pins. They are supplied to change the user’s vaping experience and have two different designs. They will improve the flavor of some juices but this is really a subjective impression from utilizing the pins. You will have to test them yourself and see how they improve your vape. The use of pins is what makes this tank different and I appreciate the Uwell’s attempt to customize the tank internally for different preferences.